If you are looking for information on the Pacific Power Batteries franchise business opportunity, Pacific Power Battery franchises or Pacific Power Batteries franchising, then you have come to the right place. This unique retail and wholesale business serves a purpose by meeting the growing demands of portable power, alternative energy and consumer electronics. The average home has a minimum of 14 different batteries while businesses often have more! 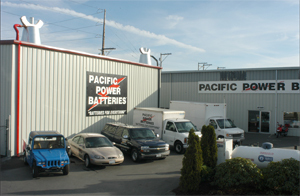 A Pacific Power Batteries franchise will meet those needs. Many retail customers return 5 to 12 times per year. Some resellers and commercial customers, such as fleets, need batteries weekly or bi-weekly. Owning a Pacific Power Batteries franchise provides you with a proven proprietary system. Pacific Power Batteries has been fine-tuning that system since it started in 1985. Positive Community Impact: Your store becomes THE resource for all battery needs including specialty and hard-to-find types. As a Franchisee, you will be the BATTERY SPECIALIST in your community! Proven Major Markets include business to business, industrial, government, military, local municipalities, off-grid/solar/wind consumers and all general consumers. Clean, vibrant, interesting stores are inviting to men, women, seniors and children who may not be familiar with batteries or electrical components. Our displays of electric vehicles, golf cars, solar panels and inverters bring in a variety of customers. Sure we sell auto, truck, RV and Marine batteries. But OUR stores are dynamic retail stores for DC portable power that get people thinking about cool, energy efficient and fun stuff. We are also a drop off site for recycling of all types of batteries: a great resource for today's businesses and consumers. Excellent franchise support system strengthens the network of Pacific Power Batteries stores. Product knowledge, customer service, marketing strategies (which we teach you), and purchasing power are essential in today's highly technical, price sensitive and rapidly changing battery markets. Time for family life! The normal business hours of a Pacific Power Batteries store allow for family time. Staying active, involved, healthy and refreshed is essential to a successful life. Our proven system makes your business manageable. 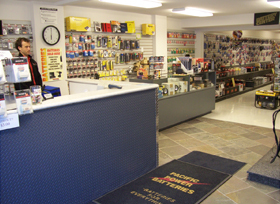 What Distinguishes a Pacific Power Batteries Store? The logo'd signage with tag line is clean, simple and easy to read from a distance. A changeable letter reader board with a permanent logo on a building or pole sign displays clever messages and specials for which we provide fresh message suggestions. Inside the store, the floors and facility are clean and brightly lit and music plays in the background. Logo'd floor mats immediately show the customer the brand consistency. The diamond plated sales counter shows a distinct, clean, industrial look. It's not a coffee shop, but it's clean and organized enough to be one! Each store displays a variety of categorized products displayed on slat wall, giving it a modern look that customers can follow logically. The staff is easy to identify in their red jackets and shirts with company logos and name tag and black pants that carry out the "positive/negative" DC power theme. Unlike many other battery businesses, women, children and seniors are welcomed and are comfortable shopping in Pacific Power Batteries stores. There are learning exhibits for today's energy conscious market: solar panels, wind generators, electric NEV's (neighborhood electric vehicles), electric scooters, bicycles, low voltage lighting and peddle generator displays. Our stores have imagination! The cornerstone of the Pacific Power Batteries store operation is the proprietary operating software called, "POWER." You will have this program to network products pricing, costs, point-of-sale invoices, reports, location of inventory, usage, sales and instantaneous gross profit reports to name a few. Trademarked Brand and Logo with a tag line: "Batteries for Everything!" Having started in 1985, our operating experience gives you a comprehensive and tested system - from purchasing to merchandising to point-of-sale. Access to virtually all of the major and minor brands of batteries at our near Distributor pricing. Our well trained and friendly staff in our stores are always available to provide you with product and customer service support when you need help and it's toll free! Training at your site and at the Affiliate's with outside sales trainers for fleet, military, municipal and reseller customers. You will learn how to promote your business effectively, grow your business in your area of interest, and get connected in your community. We will advise you on site selection with our criteria, including signage and colors, merchandise layout and design so you can start up quickly an efficiently. Continuing support with promotions, new product introductions, and refining customer service techniques. Grand Opening planning, support and coaching. Extensive three week training at our Affiliate stores will get you connected with your business. Got a question? Call any of our stores for a quick answer! Access to the latest in Alternative Energy designs and products from electric scooters, NEV's, and Plug n' Drive autos that obtain freeway speeds for up to 50 miles. This is a really interesting field that requires lots of batteries! Web business referrals from the Franchisor's website. We gladly will refer business to your store's area for you to capture. Our website currently experiences an average of 8200 page views each month. You have the opportunity to tap into it. Periodic visits to your store to assist you with general operations, employee training and fine-tuning your business. Customer analysis of your store sales and performance to help you focus on making the business work well for you. We are smaller than our competitors, but that allows us to provide you with more individual help, making it easier than if you are Store #319.